This week, I presented to the Nashville PRSA chapter about Google Analytics for Public Relations Professionals. The biggest ah-ha moment based on feedback from attendees was the need to diagnose \”Dark Social\” and the impact on analytics. 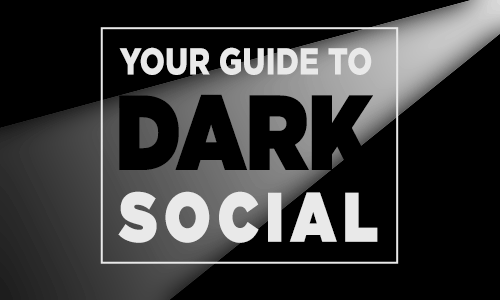 This guide will help you understand the issue, diagnose your own Dark Social, take steps to prevent it and report more accurate results to your boss or your clients. Dark Social is social media traffic that Google Analytics thinks is direct traffic. It happens when people share links to your website socially but not necessarily in social media. Think email, IM and mobile apps that have social sharing functions. These tools encourage sharing content with your networks, but Google Analytics cannot track traffic from these links. Dark Social means that you are likely reporting too much direct traffic and too little social traffic — neither of which is a good scenario for your analytics. I looked at the analytics from when I joined the firm in February. The announcement was primarily through social media. I created the custom report showing traffic sources to the landing page for the announcement. Of the 232 visits, 46 were direct visits, meaning about 20% of visits from our announcement was Dark Social. Most people spell my name wrong so I\’m sure they didn\’t type the URL. I\’ve seen estimates for other sites as high as 40%. The scope of the problem will likely depend on the scope of your social media efforts. Google Analytics created an advanced segment in the Google Analytics Gallery you can easily import into your account. It will find any direct traffic to a landing page that is not the homepage. This data isn\’t perfect, but it is a good starting point. You may have some landing pages that you marketed offline, e.g. a URL on a billboard or in an ad. You would hope to see some direct traffic to these pages or your marketing really wasn\’t effective. You can exclude these landing pages by adding an additional rule to the advanced segment. The deep links are your most likely Dark Social candidates. The GA advanced segment is a great starting point to understand the issue. Campaign variables are an important first step to take. The Google URL builder helps you create links with the correct UTM parameters for GA. I have yet to find a good tool for tracking campaign variables. If you know of one, please let me know in the comments. For the more advanced user, Luna Metrics has created a tool called DirectMonster.js. It automatically adds parameters to any URL on your site. It then decodes those parameters when links are shared. I have grossly oversimplified what DirectMonster.js does. Make sure to read the Luna Metrics post for more details. Reporting is a fundamental of any marketing campaign. Knowing that Dark Social is an issue, we\’re going to change how we report social media results for our clients. Specifically, we will include report section about Dark Social where will explain the results and offer some observations about the impact. It\’s nice to see companies like Chartbeat already including this option in their offerings. Let me know in the comments if and how you are already reporting it. The origin of Dark Social began with Alexis Madigral and his article for The Atlantic entitled Dark Social: We Have the Whole History of the Web Wrong. The article is a must-read as you began exploring the impact of Dark Social on your analytics. Nobody is disputing the fact of Dark Social. As you can imagine, opinions vary on the impact. Journalism.co.uk — Is there more to hidden traffic than \’dark social\’?